Videos, worksheets, solutions, and activities to help Grade 9 students learn about adding and subtracting radicals. 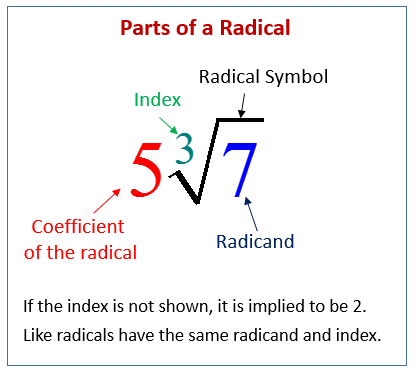 The following diagram shows the parts of a radical: radical symbol, radicand, index, and coefficient. Scroll down the page for examples and solutions. How to Add and Subtract Radicals? In order to add or subtract radicals, we must have "like radicals" that is the radicands and the index must be the same for each term. The radicand is the number inside the radical. Radicals that are "like radicals" can be added or subtracted by adding or subtracting the coefficients. 1. Break down the given radicals and simplify each term. 2. Identify the like radicals. 3. Add or subtract the like radicals by adding or subtracting their coefficients. Students learn to add or subtract radicals by first breaking down the given radicals and simplifying each term, then combining terms that have the same number inside the radical. This video looks at adding and subtracting radical expressions (square roots). It includes four examples.